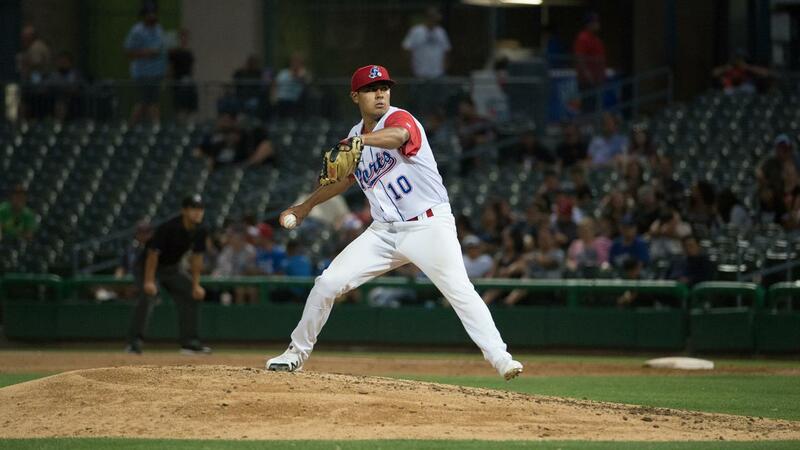 STOCKTON, Calif. - The Stockton Ports fell behind early and never recovered on Sunday night at Banner Island Ballpark. The Visalia Rawhide scored four runs in the top of the fourth inning on their way to a 10-2 win over the Ports in the third game of their four-game series that closes out the 2018 regular season. Visalia plated four runs in the top of the first inning to get the scoring started. Adam Walton led off with a single and Jazz Chisholm followed with a two-run homer that got the Rawhide started. Ramon Hernandez came up next and was hit by a pitch and Pavin Smith followed with a double. Marcus Wilson delivered a sacrifice fly to center and Renae Martinez followed with an RBI single to left to make it a 4-0 contest. Ports starter Xavier Altamirano (5-6) allowed his fifth run in the third inning as Renae Martinez walked with two outs and scored on an ensuing double by Anfernee Grier to make it a 6-0 ballgame. Altamirano worked into the fifth and gave up a leadoff home run to Hernandez, followed by a walk to Pavin Smith and a single to Wilson, at which point he was lifted for Brendan Butler. Later in the inning, Stephen Smith would hit into a fielder's choice force play that produced Visalia's seventh run of the contest. Altamirano would suffer the loss, going four-plus innings and allowing seven runs on seven hits while walking three and striking out four. Butler gave up a pair of runs in the sixth inning on a two-out, two-run single to Wilson to make it 9-0. They were the only two runs allowed by Butler in his two innings of relief. Jake Bray took over in the seventh and gave up a leadoff single to Grier, who scored on a two-out single by Chisholm to make it 10-0. It was the only run allowed by Bray in two innings of relief. Sam Sheehan worked a perfect ninth for Stockton. Rawhide starter Cole Stapler (1-7) escaped a bases-loaded jam with two outs in the third and never found himself in another tight spot over the course of his outing. Stapler went six scoreless innings and allowed three hits while walking two and striking out five. Erbert Gonzalez and West Tunnell worked a perfect seventh and eighth, respectively, for Visalia. Matt Brill took over in the ninth and, with two on and two out, saw Edwin Diaz reach on an infield single to third. The throw from the third baseman Hernandez to first was high and hit off the sidewall near the dugout, allowing Viosergy Rosa to cross home plate with Stockton's first run of the game. Brett Siddall followed with an RBI single to right to make it 10-2. Brill, though, would get Santiago Chavez to ground out to third to end the ballgame. Brill allowed two runs on two hits while walking two in his lone inning of work. The Ports and Rawhide wrap up the regular season on Monday night at Banner Island Ballpark. Grant Holmes (0-0, 3.00 ERA) makes the start for Stockton. Visalia has yet to announce its starter for the contest. First pitch is set for 6:10 p.m. PDT.